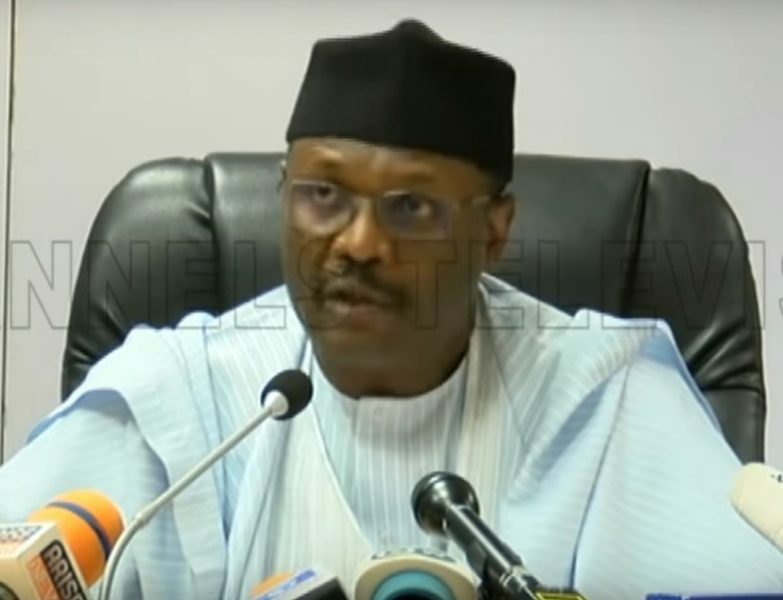 Screenshot of INEC Chairman Professor Mahmood Yakubu, announcing the postponement of the Nigerian General Elections on February 16, 2019 in Abuja, Nigeria. Nigerians woke up on Saturday, February 16, to news that presidential elections will no longer be held as scheduled for that day. The Independent National Electoral Commission (INEC) announced that that the presidential and national assembly elections will now be held on February 23, one week later, while the governorship and state house of assembly will be held on March 9. The electoral commission has halted the elections due to its inability to implement “logistics and operational plans” ahead of the elections. The 2015 presidential elections were delayed for six weeks over security challenges. However, this is the first time in Nigeria’s history that an election will be canceled less than five hours before the commencement of polls. The 2 times @osasuigbinedion asked @INECNigeria Chairman if the elections would be postponed. These fears persisted until the eve of the elections on social media. But Tolu Ogunlesi, head of digital media in the presidency, dismissively branded it as propaganda from the opposition. #NigeriaDecides2019 going on as planned tomorrow. Don’t listen to any #DubaiStrategyOfLies peddling gist of a postponement. Thank you and God bless the Federal Republic of Nigeria. The coordination of the election by the electoral commission encountered many challenges. Less than two weeks before the elections, there were fire outbreaks in INEC offices in Plateau, Abia, and Anambra States, which destroyed electoral materials like uncollected Permanent Voters Cards, smart card readers and ballot papers. Also, on the eve of the elections in Kaduna State on February 15, 66 people — including 22 children and 12 women — were allegedly killed by unknown gunmen. These killings have not yet been independently verified. This led credence to the rumour that elections may be deferred to a later date in affected states. Staggering the elections is a recipe for disaster! INEC must resist any attempt to get it conduct elections in a few states tomo. Elections must be conducted in every part of Nigeria whatever it takes. Burning Card Readers is just a strategy. WhatsApp broadcast and group messages, largely adopted by political parties during this election to win support, aggravated this apprehension. These social media groups have stoked rumours and spread misinformation and disinformation. The Buhari administration hopes to disenfranchise the Nigerian electorate in order to ensure that turn out is low on the rescheduled date. Nigerian netizens have reacted strongly against the last minute rescheduling of the presidential polls by INEC. Excuses do not cut it. This isn’t the first time general elections are being held in Nigeria. INEC failed to do its job, of providing the required logistics support for the process. I have never heard of election postponement, barely 5 hours to the opening of ballots. SHAMEFUL!! I’m trying really hard to be positive about this but I don’t know how I’m going to manage it. Why on earth would elections be postponed with just a couple of hours left? At what point did they realise that they had issues and why did they wait until the last minute? Waste of time and resources for candidates, supporters, traveling voters, and even the government itself. Would it have killed the person who drafted that @inecnigeria letter to add “The Commission understands that this decision has been announced rather late and sincerely apologizes to all voters and election stakeholders for any inconvenience caused” at the end? This is the most wicked and barbaric evil action against the Nigerian people. People left their business and travelled so as to vote!! 1. What are the logistical issues? 2. Which states where affected? 3. What will happen to sensitive ballot material already deployed? 4. Who guarantees safety & sanctity of ballot material already distributed? 5. What is cost of postponement? INEC is not saying the truth! This is preposterous. You had years to plan for this. We are not seeing the truth. Apathy is not an option. We’ll vote next week! Nigeria’s electoral commission left many questions unanswered. The decision spiked tensions and casts doubt on the credibility of the presidential elections. It also reinforces the need for a genuinely independent electoral commission. Until INEC is completely weaned from executive manipulation and interference, election postponements will continue to happen in Nigeria.